As first noted by developer Olga Osadcha, Apple is testing a related search suggestion feature on the App Store, which started rolling out earlier today for iPhone users on iOS 7. 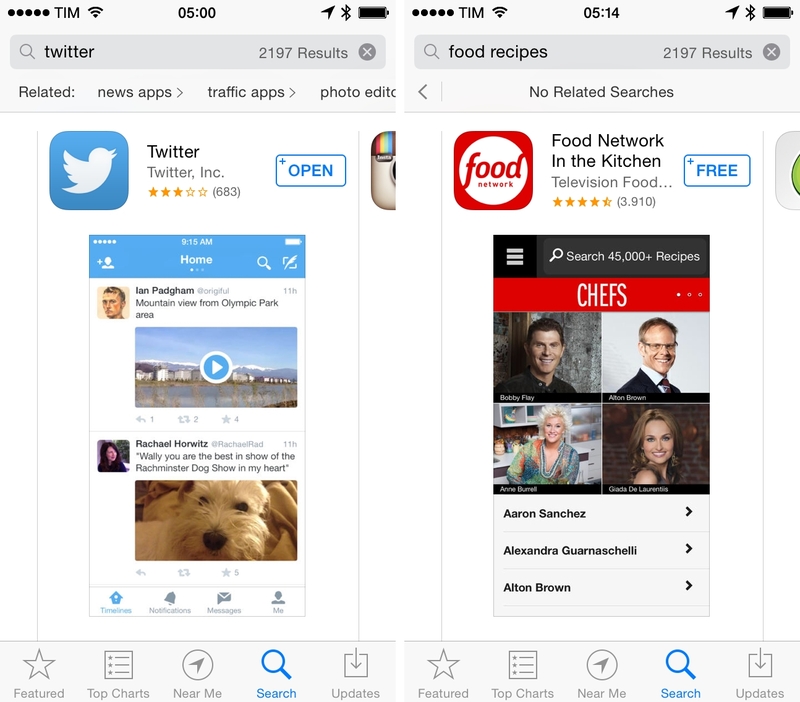 The new menu, a scrollable bar with suggestions for searches related to the current search, allows users to discover more apps in search by tapping on suggestions, receiving a fresh set of results. Multiple suggestions can be selected in a single session: searching for “indie games”, for instance, displays suggestions for “action games”, which include “action RPG” into their own suggestions. The new suggestion bar doesn’t alter the way search results are displayed – Apple is still using a cards layout on the iPhone – and, for now, the feature doesn’t appear to be available on the App Store for iPad and desktop computers. The new related search suggestions mark one of Apple’s first attempts to augment App Store search results with visual semantics for apps. In testing the feature, I was able to get suggestions for specific sub-categories such as “business news” and “video game news”, “writing” and “story ideas”, or “healthy cooking” and “food recipes”; each set of related searches included new results that were more specific and relevant to the suggested search. A suggested search can branch out to more sub-suggestions (that was the case with the aforementioned games example), but I also noticed related searches that had no additional searches inside them. Aside from the additional bar for suggestions, results were displayed as normal cards with no additional changes. It’s unclear whether this new feature could be based on Apple’s curation efforts with custom sections, keywords chosen by developers for their apps, popular searches on the App Store, or a combination of all these existing pieces of metadata. Over the past few years, Apple has built a large catalogue of curated sections (called Collections), which, however, don’t appear to be the primary source of search suggestions. Related searches ranged from generic terms and phrases like “writing” and “news” to mixes of company and product names such as “word excel” and “game loft”, suggesting that Apple may indeed still be testing and tweaking the feature before a wider rollout. With over a million apps on the App Store, search has often been mentioned as one of the areas where Apple could make significant improvements to enable customers to discover relevant apps more easily. 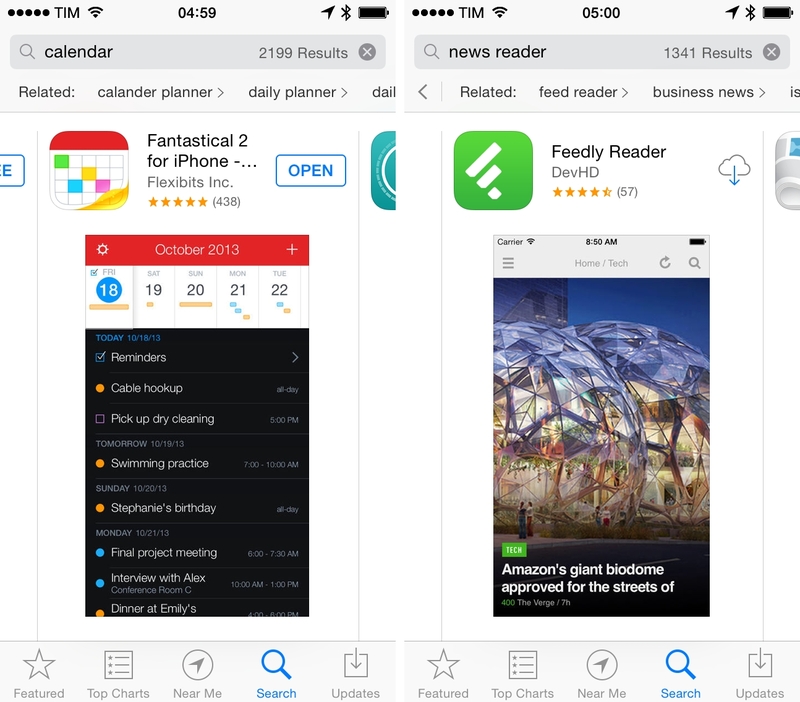 Two years ago, Apple acquired App Store search engine Chomp in a move that was believed to bring new user features for App Store search and recommendations, which, however, didn’t materialize with iOS 6 and iOS 7. While the company introduced a feature to discover apps popular nearby last year, the new search suggestions could provide a general layer of filtering that is independent from geographical location. At this point, it’s not clear whether Apple may be optimizing search suggestions based on user taste and purchase history – first tests suggest that related searches are simply based on app category rather than user personalization; right now, it’s hard to tell whether some search suggestions may have been manually curated by Apple or not. In the past year, App Store optimization (or “ASO”) has become a common practice for third-party developers willing to ensure their apps would rank highly in Apple’s search algorithm – which the company also tweaked multiple times. With more specific searches directly suggested to users when searching, Apple could alleviate the problem of good results being buried below worse results with higher ASO values, giving users more relevant and specific apps in an increasingly crowded marketplace.